Your website is made up of unique groups of people. That might be a group of people who use certain devices, people who are looking for a specific type of information, people who visit from a certain source, people from a certain geographic region, or more. Each group behaves differently, at least somewhat, from other groups during a visit. One group might look at a certain page more than another. Another group may be more interested in converting than another group. To really know how to improve your website, you want to view data about each group separate from the data about other groups. If you view data for all the groups mixed together, you’ll certainly learn something (it is better than not viewing data). But, without separating out each individual group, the data becomes messy and it is hard to know who your visitors are. With everything mixed together, it also becomes harder to spot problems or new opportunities. For instance, which group represents your best customers? You want to make changes to your website to do even more to support these people. On the flip side, which group is having the hardest time using your website? Maybe a technical issue affects this group keeping them from converting no matter how much they’d like to convert. If you aren’t looking at your stats group-by-group, you wouldn’t be able to answer these questions. The way you separate out groups is to segment your data. 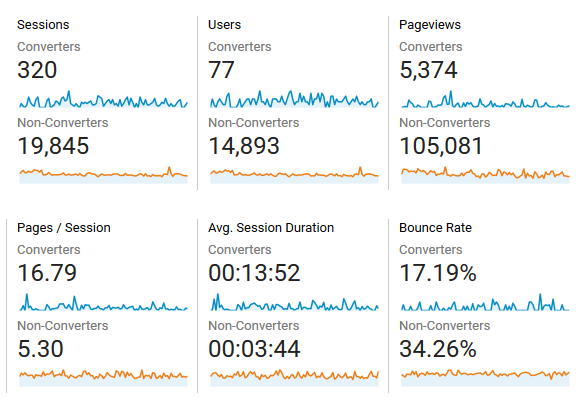 The ability to segment is one of the most useful and beneficial features in Google Analytics, but it is also one very few people I talk to and work with actively use when viewing their reports. The rest of this blog post will talk about segments you can use. For a quick introduction to using Google Analytics segments, watch this video. For more detailed help, you can request a Google Analytics Review + Setup + Training session with Elementive. You can segment by just about anything in Google Analytics. 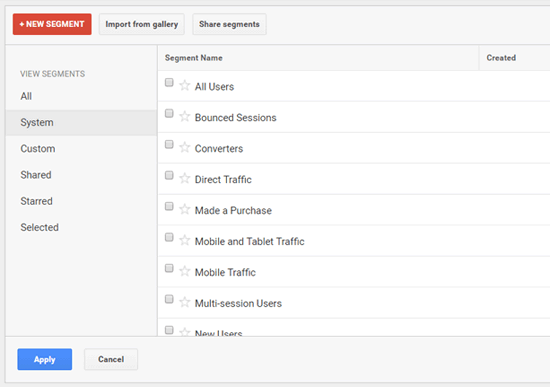 Along with built-in (or system) segments, Google Analytics also gives you the ability to create custom segments. For instance, you could segment by people who looked at your about page before continuing on to your product pages before finally reaching your contact page. Or, you could segment to show people who came to your website from an organic Google search and spent at least five minutes visiting your website. The problem is with so much ability to segment your data you run the risk of segmenting your reports into meaningless oblivion. There is a time and place to use really complicated custom segments. But, for most websites the over complication in what to segment isn’t necessary. For all but a handful of clients I’ve worked with, the built-in segments prove to be the most beneficial. These segments do a great job helping you identify and understand the broad groups of people who are visiting your website. By using these segments you almost always will come across areas you need to improve or areas presenting new opportunities on your website. 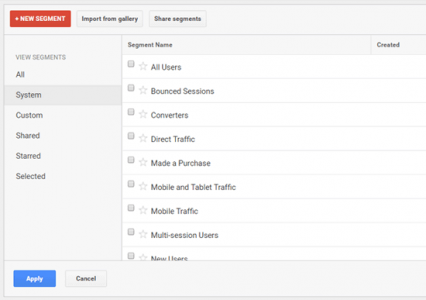 The available built-in, or system, segments in Google Analytics. People visiting while using a phone might have different needs and interests than a person visiting your website from their website. This means that people using a certain device comprise a unique group of visitors. Segmenting by device can help you understand these differences so that you know how to deliver what each group of visitors wants. Mobile Traffic – This lets you see all smartphone traffic. This is really helpful to determine how people on a smartphone behave differently than everybody else. Do they look at different pages? Spend more time on the site? Bounce away more frequently? Chances are you have a different design for mobile, so this segment will you see just how well that design works (or doesn’t). Tablet Traffic – This segments to only show data for visitors from a tablet device. Like the mobile segment, you probably have a unique design for your website to support tablet visitors and this can help you evaluate how well that design works. Mobile and Tablet Traffic – Your smartphone and tablet designs are probably different. After all, the screen sizes are different between mobile and tablet devices. If your designs are different, then this segment won’t really help you evaluate either design since it has merged two different groups of visitors into one. I’d generally suggest avoiding this segment. Tablet and Desktop Traffic – Your website’s design for tablet and desktop screens might actually be quite similar to each other. If they are, then this segment lets you see how people interact with that design. Of course, even if the designs are visually similar, people on a tablet might have different expectations than somebody visiting from a desktop computer. Maybe the visitor on a desktop computer is more likely to convert than the visitor on a tablet device. In that case, this segment could combine two very different groups of people. One problem is that Google Analytics doesn’t have a built-in, or system, segment for Desktop Traffic. I don’t know why because it can be really handy (people still do use desktop computers). So, here is a simple custom segment you can add to Google Analytics to segment by Desktop Traffic. Click here and follow the prompts to add this segment to your Google Analytics account. To greatly oversimplify, you have two types of visitors: those who don’t convert and those who do. The work of improving your website should (at least in part) involve getting more people to belong to the group of converters instead of the group of non converters. A large part of that is going to be comparing these two groups–what pages do converters look at that non-converters don’t, do converters spend more time on the site, are converters coming from a different traffic source, or something else? Google Analytics offers two system segments: Converters and Non-Converters. If you turn on both segments at once, every report will show you the data for what each group did. This gives you an instant comparison to start spotting differences between the two groups of visitors. The more differences you identify, the more ideas you can come up with to move people from the non-converter group into the converter group. Comparing segments, such as converters vs. non-converters, can be helpful to identify how these two groups use your website. 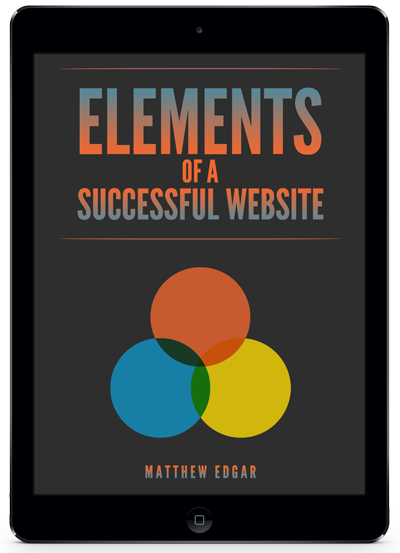 Another great way to group your visitors is by the source that led them to your website. People coming in from a Facebook post may want to just read your latest blog post. People who clicked on ad, though, may want to convert today. In other words, these are different groups of visitors and you want to understand what each group wants during a visit to your website so that you can best serve each group. Direct Traffic – representing all visitors that directly came to your website–like typing in your URL into the address bar or clicking on a bookmark. These visitors probably already are familiar with your website and your organization. Organic Traffic – representing all visitors who found your website on an organic search result. In many cases, this might be new people who are finding your website and your organization for the first time. Paid Traffic – this represents all the visitors you directly paid to get to your website. You want to make sure this group of visitors is getting what they want and delivering enough value for your organization to ensure the ads you paid for are worth it. Referral Traffic – this represents visitors who clicked on links to your website from a link somewhere else on the web. By default, this includes social media networks as well. There’s much more you can do with Google Analytics segments to understand your audience. Hopefully, this blog post gave you some ideas. Certainly, feel free to contact me if you have any questions or need help working with segments.